Luxurious and serene eco retreat in the rustic countryside of Chiang Mai overlooking fields of rice paddies, with healthy and delicious food to indulge and rejuvenate. Dates: 26th of February to the 4th of March, 2019 (7 days, 6 nights). Location: eco-resort near Chiang Mai, Thailand. Program: Process focused classes & mentoring (details here). Coursebook & notebooks / pens: Comprehensive resources & notebook / pens for note-taking. Lodging: 6 nights accommodation in a deluxe villa with air conditioning. Classes to help facilitate creation: Twice daily complimentary daily yoga / meditation (optional). Rest / excursion day: A rest day to relax, work on your project, or go for excursions (at additional cost). Abundant indoor and outdoor areas for creating, thinking, and relaxing including a salt-water swimming pool. Herbal sauna & swim evening to detox & rejuvenate. Delicious plant-based meals made from locally-sourced ingredients. Daily morning & evening restorative/yin yoga (optional). Floating experience (Bungalow Flotation Room, located inside the retreat venue: 650THB per session). Visit to the hot springs (Sippa hot springs". Cost: 250 THB entrance fee, transportation excluded). Visit to Doi Saket temple & local market (Free; they are within walking distance from the retreat venue). 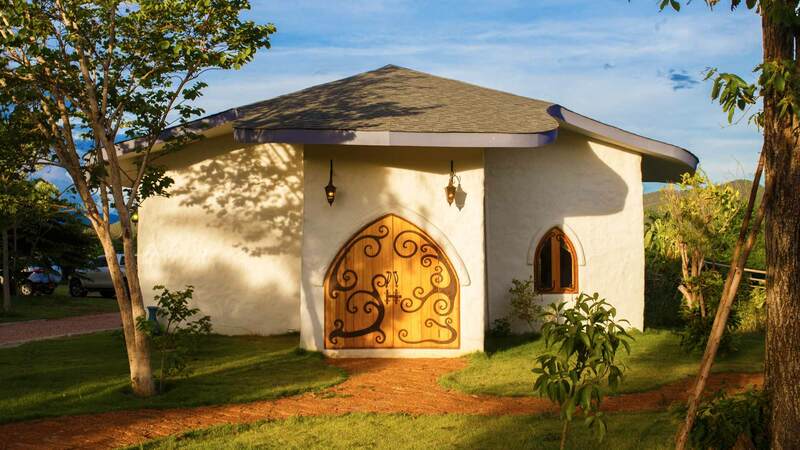 Four luxurious villas: The Bamboo, The Dhara, The Hobbit and The Raindrop. Five superior accommodations: The 2 Mala Villas, the Jai Dee Villa, the Makam Room and the Teak room. 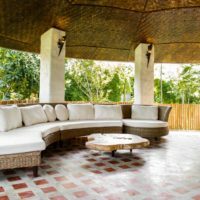 The Bamboo Villa is a large, high-ceiling villa with a spacious indoor sitting area, indoor bathroom with moonlight views and an enormous outdoor veranda with a lusciously curved couch. The standard fridge, wifi, air conditioning and extra fan will add to your comfort. The Bamboo Villa acquired it’s name firstly from the bamboo-adorned bathroom with open air views of starry Chiang Mai nights and the adjacent Organic Farm. 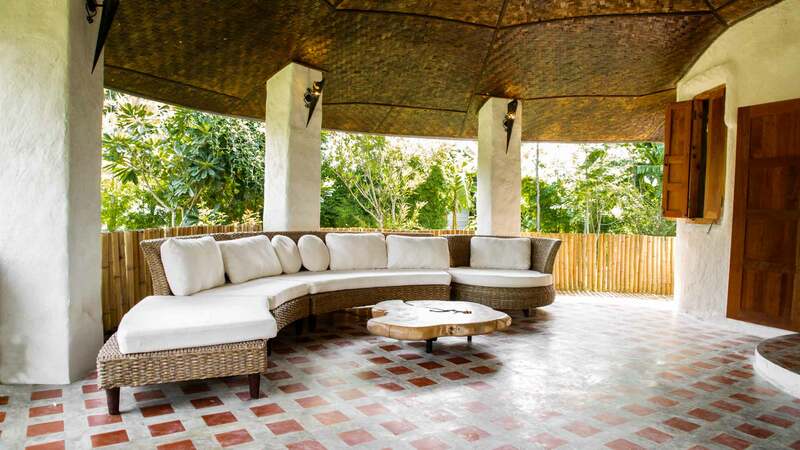 Secondly, from the bamboo fence lining the perimeter of the enormous front porch of this villa. 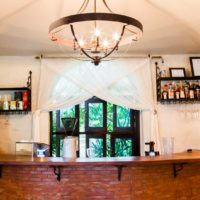 This porch is complimented by an oversized, thick, cushioned rattan couch, easily enough to support a small group of people if you plan to chat into the evening over a bottle of the venue's individually selected wines or to take a day nap, sprawled out all alone. The Bamboo Villa is one of the venue's signature earthen adobe structures and so provides the same smooth curved textured walls and high domed ceiling, though here you will find a finely woven bamboo overlay adding warm hues and timeless traditional design, centered by a quiet and tasteful ceiling fan. The windows are large wooden hand crafted shutters, which when closed block out any light, providing a deep and restful sleep and when opened give the impression of an open air pavilion – fully embracing the verdant natural surroundings of Doi Saket and serving as a reminder that you are in Northern Thailand. 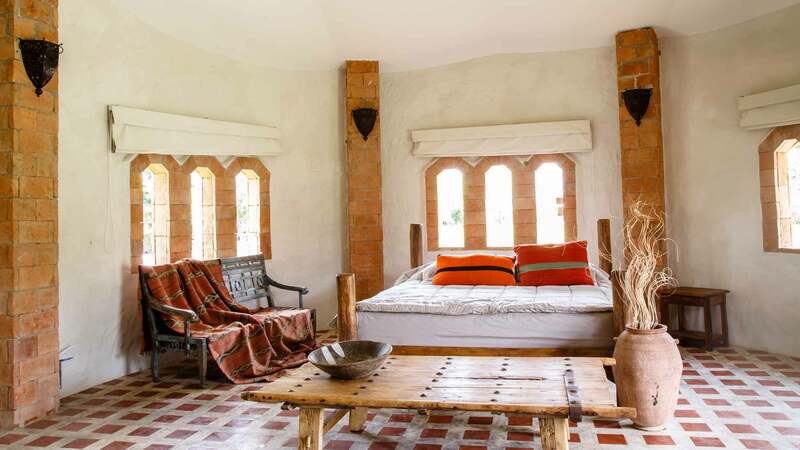 The interior of this villa is spacious enough to provide a beautiful seating area inlaid into the earthen walls and lined with pillows as well as a large double bed and hand-sewn cotton mosquito net. The bathroom has a special open air design with stylish ceramic basin and fine fixtures providing a romantic tropical element to your stay. 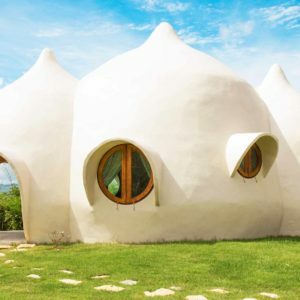 The Raindrop Villa is perhaps the most iconic structure at the venue because of the three rain drops design of the dome shaped roof. The complimentary organic nature of the structure can not be ignored as it is seen emerging from the rice fields across a wide expanse. 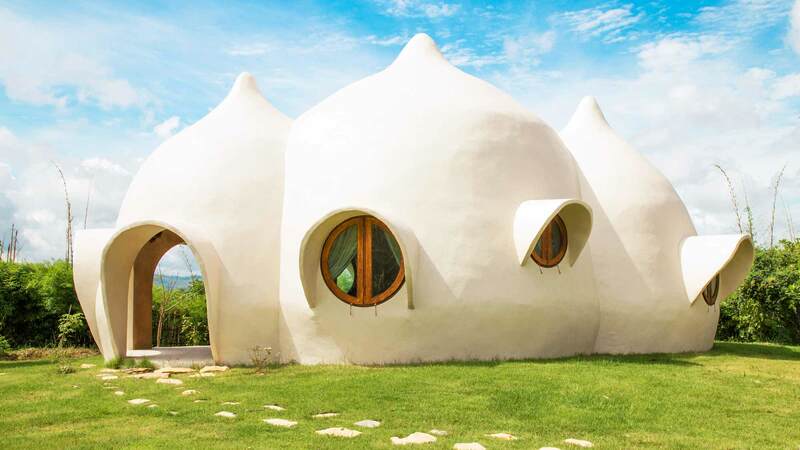 Completely circular in form and without a corner anywhere in the design, the raindrop villa promises an energetically soothing and welcoming stay for every guest. Even the windows are circular. 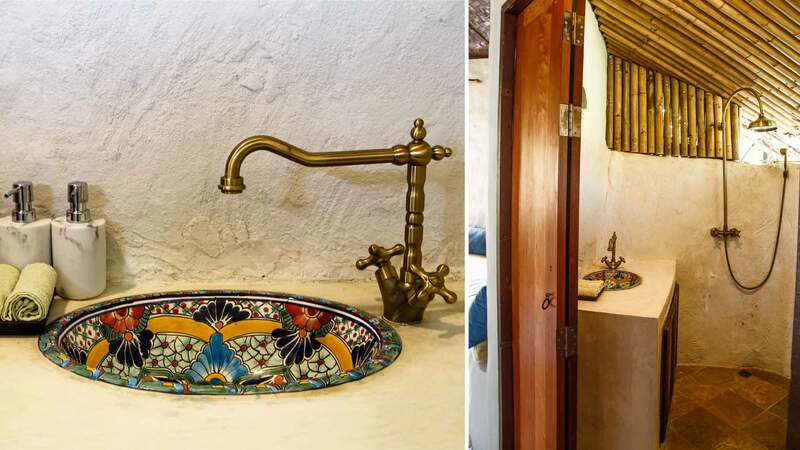 The bathroom in Raindrop Villa has the same unique attention to detail you will find in each and every room at the venue. 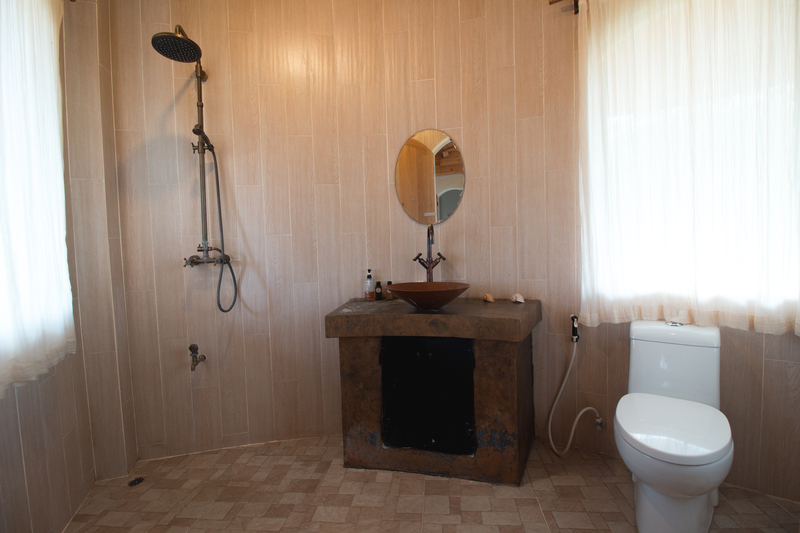 The fixtures are individually selected, the tiles carefully chosen, the sink a classic wooden basin. Towels hang neatly from a bamboo ladder and the large space and massive shower head make the entire experience luxurious. Raindrop Villa faces North toward the mountains of Mae On, with a small veranda and hammock outside and away from the other villas. The lighting is gently set with indirect and intricately designed metal wall fixtures, in doors and out and the ultra high domed ceiling supports a lovely ceiling fan while another vintage standing fan near the bed assists in providing the breezy ambience. 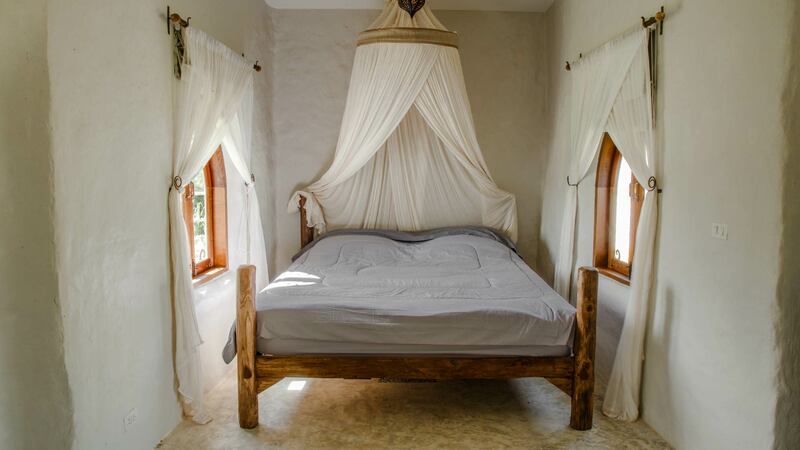 The large soft and cozy double bed in the Raindrop Villa guarantees a restful night sleep. 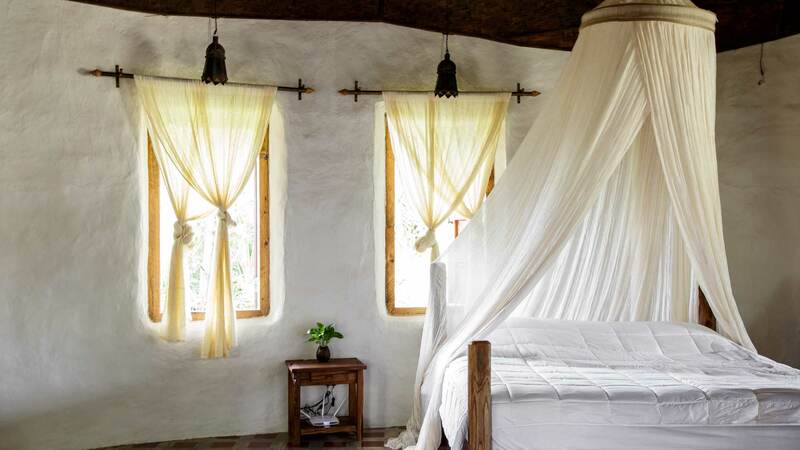 Surrounded by custom designed cotton mosquito nets and strewn with soft pillows, it takes one of the famous venue breakfasts, our organic coffee, or the lure of a morning run to the local Doi Saket hot springs just to get you up and out of bed. All of this is complimented by carefully chosen and tastefully designed wooden furniture. Rest assured however, even with all of this thoughtful and soft elegance, Raindrop Villa is supported by wifi and has a fridge for your convenience as well. 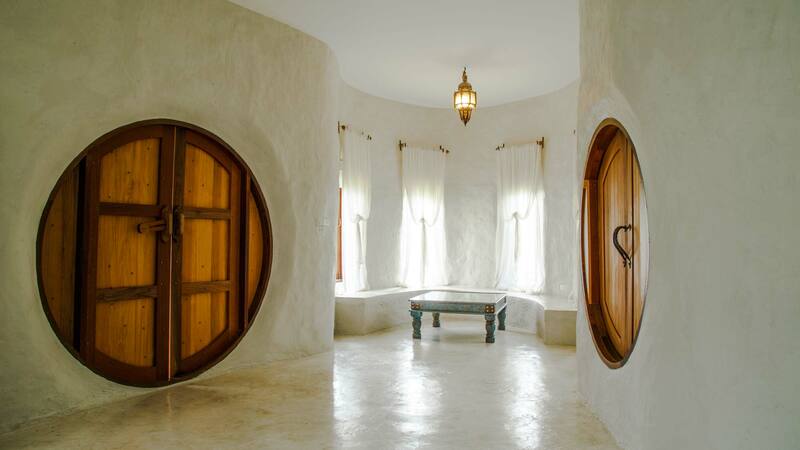 In the Hobbit Villa you enter through the handcrafted and individually designed doorway and are immediately aware that this is just a prelude to the tastefully chosen authentic furniture, brass fixtures, cotton drapes and succulent wooden bathtub. This spacious villa is well suited for those who choose avoid the pre-fabricated and life-less hotel rooms so commonly found in commercial resorts but still enjoy their comfort. 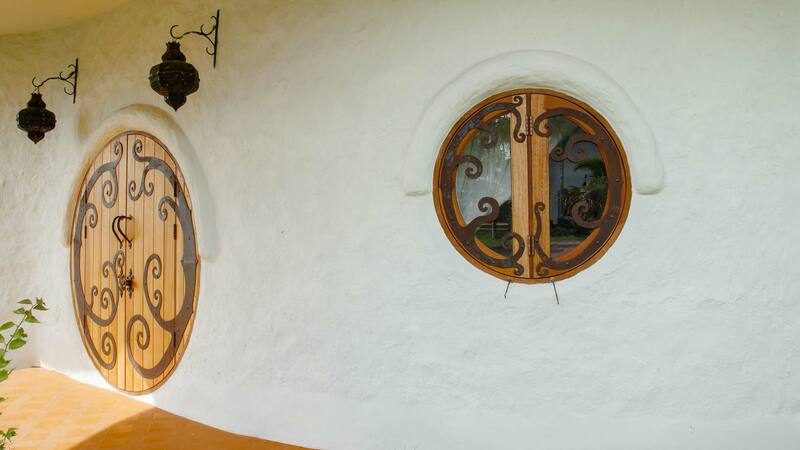 Our Hobbit Villa is so named for it’s hand made round doors and specially designed steel work on both the main entrance and the bathroom doors. 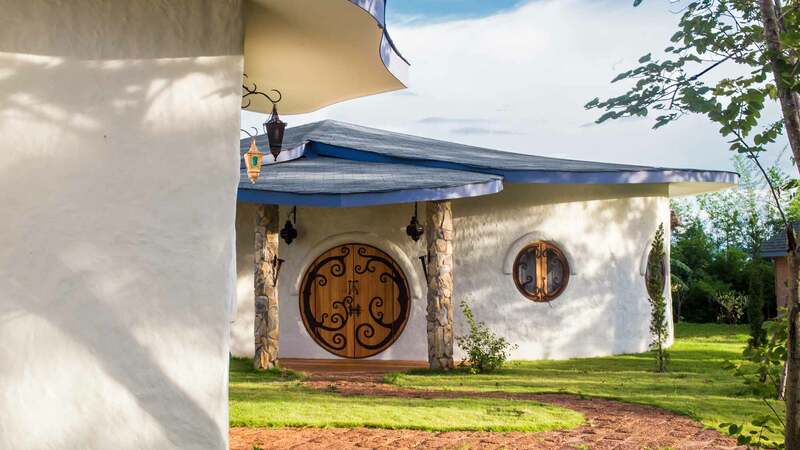 As one of our Earthen Adobe Villas, the Hobbit Villa has a unique appeal as it was lovingly assembled one molded sun-dried brick at a time by the friends and staff of the venue. If you are unfamiliar with earthen structures, don’t think for a minute that this means you will have to compromise any comfort or style. 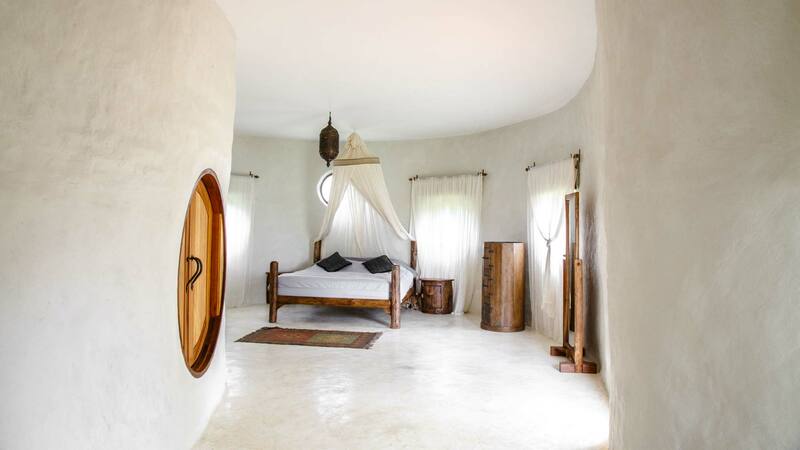 In fact, the Hobbit Villa beckons our guests to stay and enjoy the spaciousness of its interior and sitting area, warm curves, and enormous poster bed with cotton mosquito net. 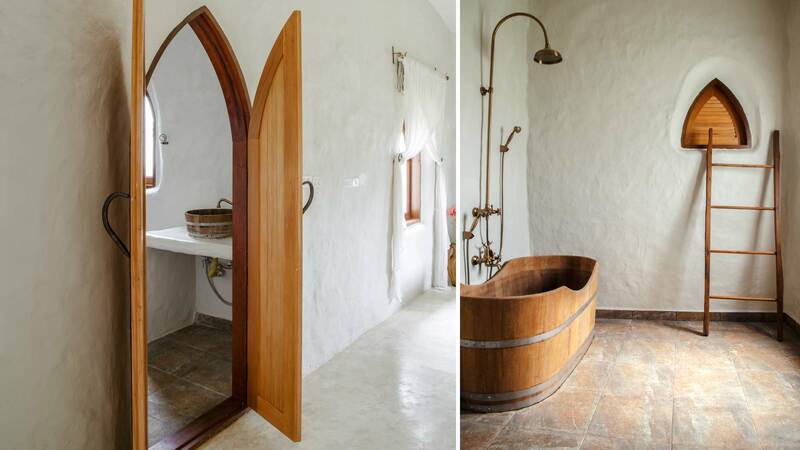 The bathroom does not disappoint, with an intriguingly large rounded doorway, rain shower and artisanal wooden bathtub. 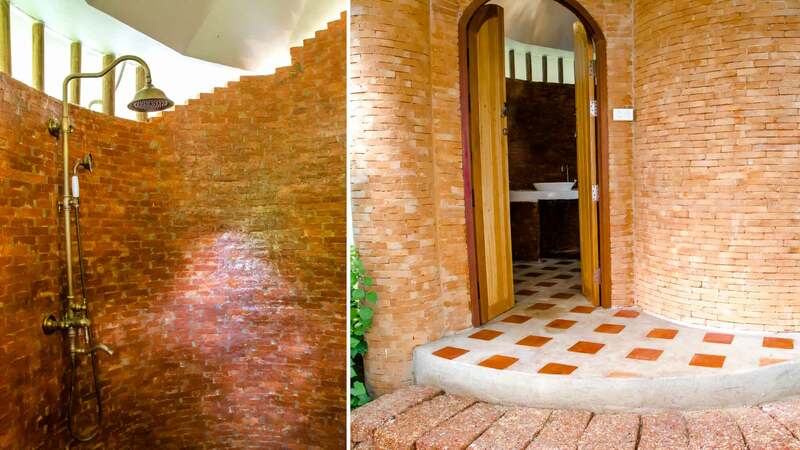 The fine fixtures, tiles and basins, a mainstay in all of the spacious bathrooms of the venue, are also present in the Hobbit Villa. 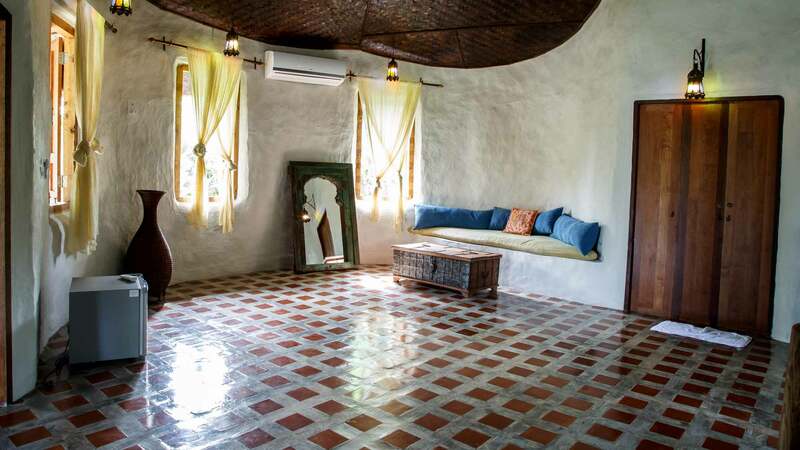 This Villa also includes the standard ceiling and standing fan, air conditioning, fridge and wifi. 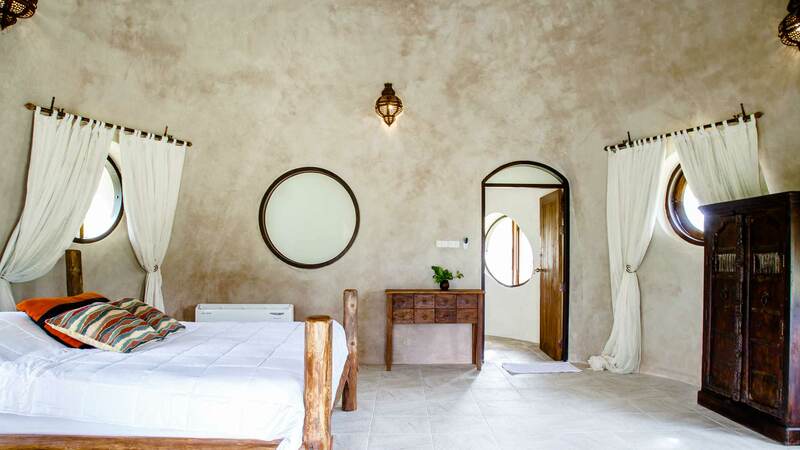 The Dhara Villa offers guests an opportunity to stay in a room with a unique, individual design, large interior and always enticing wooden bathtub. A short walk from the pool and restaurant, with aircon, fridge, wifi and king size bed with cotton mosquito net, Dhara Villa is a popular choice for guests when selecting villas at the venue. 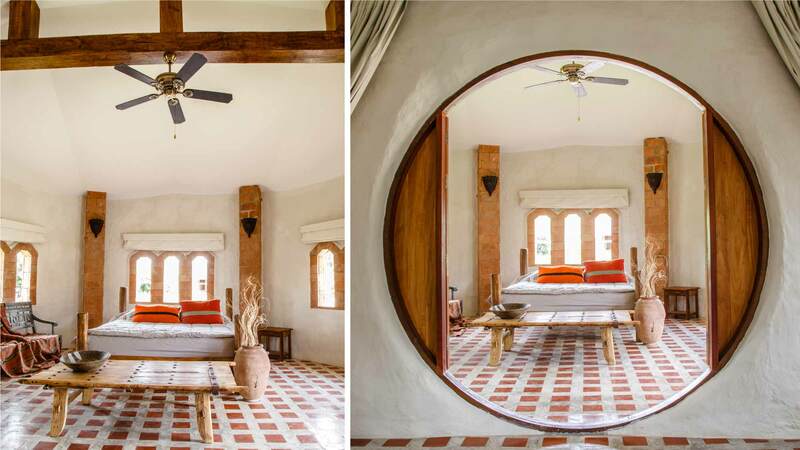 The Dhara Villa feels like coming home when you enter through the large wooden custom designed double doorway. 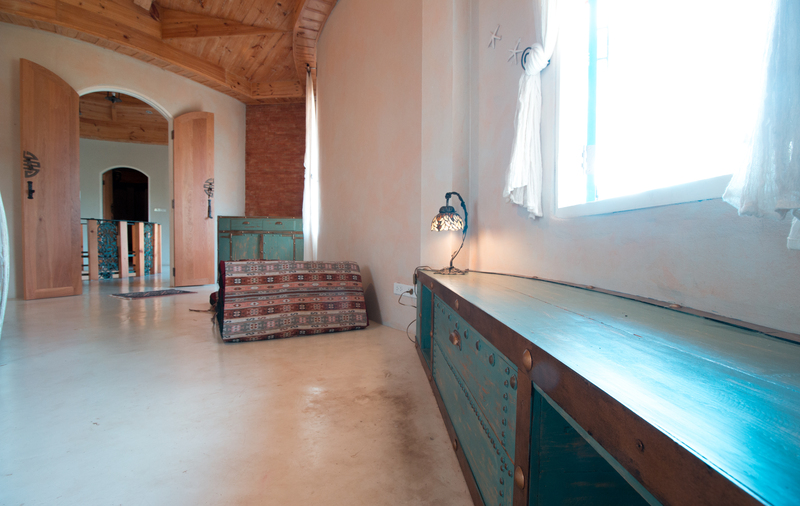 The first thing you will notice is the plentiful hand chosen, detailed wooden furniture. 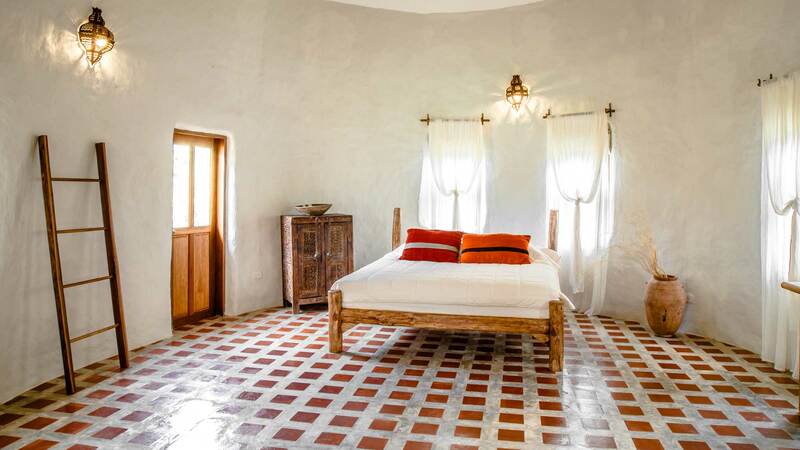 The very next thing to catch your eye might be the earthen -pillow strewn- benches designed into the walls of this adobe structure at the far end of this generously sized villa. 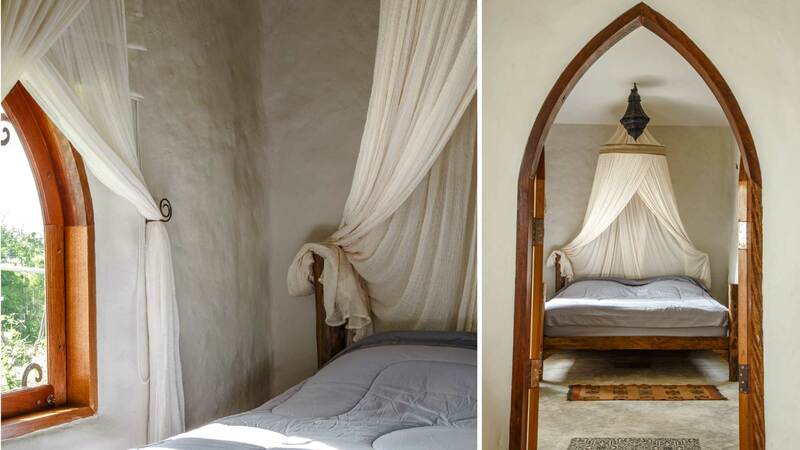 Enter a bit further and you will notice the large comfy double bed tucked back into it’s own cozy nook and sweetly shrouded in a cotton mosquito net. 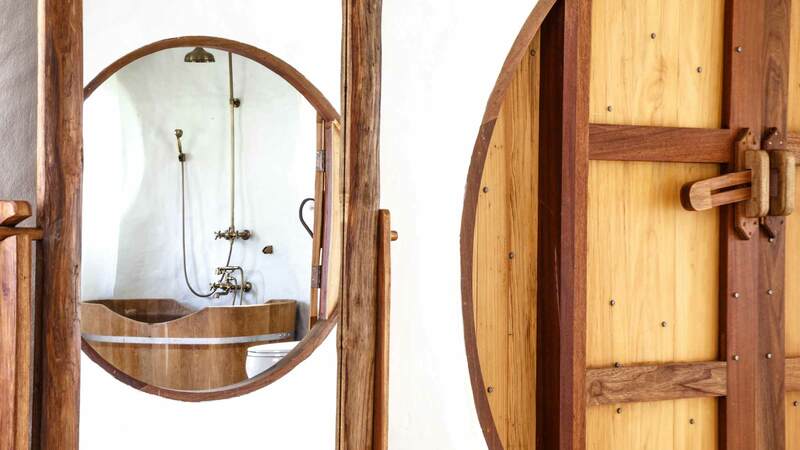 Enter a bit more and you will invariably be swept up by the enticing vision of the vintage wooden bathtub and large rain shower in the beautifully designed bathroom. 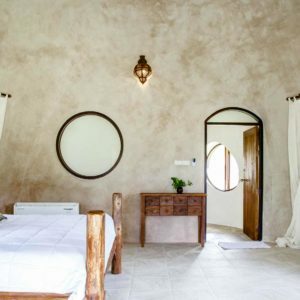 The Dhara Villa is one of the venue's earthen built structures, and this easily emanates in an almost indiscernible way from the cool soft textured curves of the design to the powerfully thick walls keeping you cool from the hot Northern Thailand days. 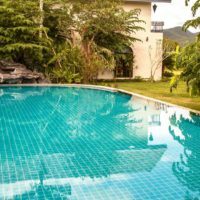 This villa has easy access to the salt water pool and contains all of the amenities of the other villas at the venue, such as wifi, aircon, a fridge and fans. 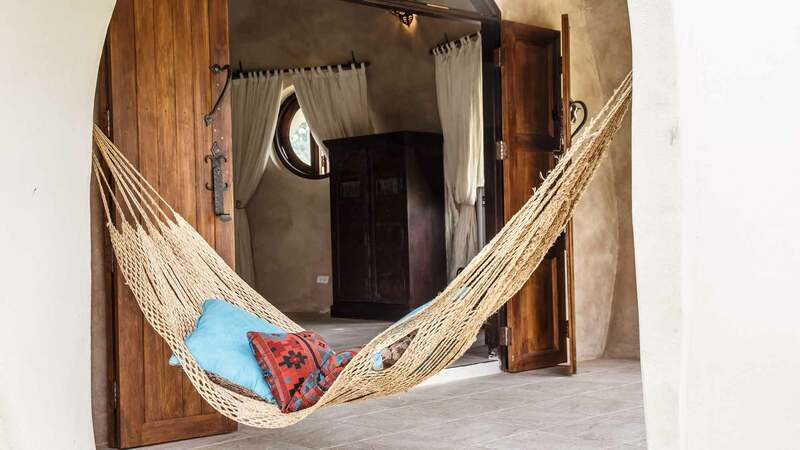 The Mala Villas are specially designed villas that can be fashioned as either two private villas with two shared outdoor bathrooms or as two connected villas – perfect for family or friends. 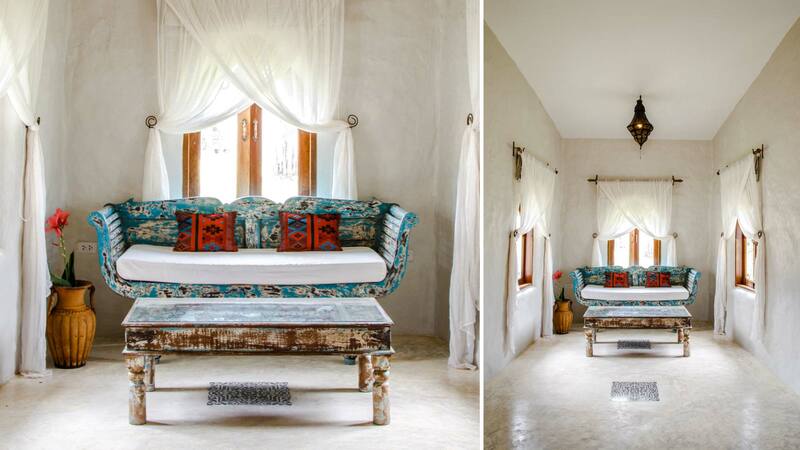 The Mala Villa has a very special design even among so many stand out accommodations at the venue. 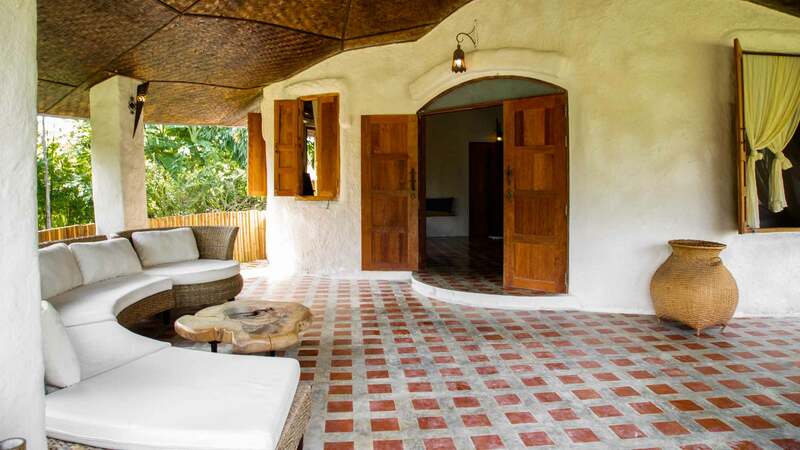 This Villa is actually separated into two Mala Villas, A and B, with two shared outdoor bathrooms to choose from: one bathroom featuring a shower in nature under the stars and one well protected. 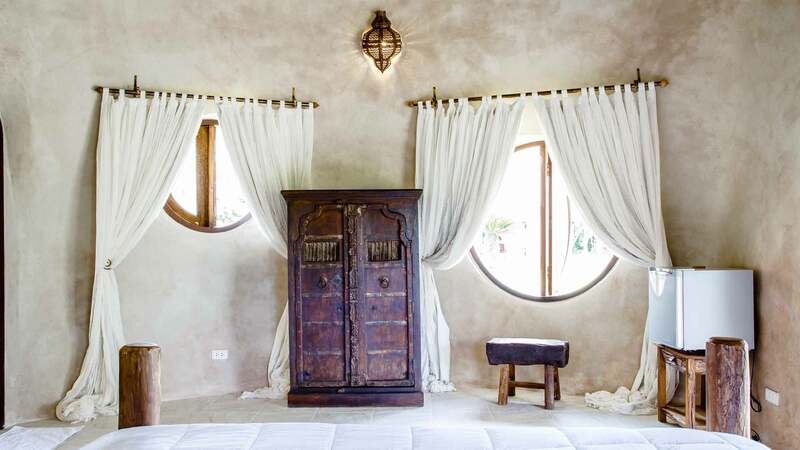 The villas have separate entrances and are connected by an enormous round glass door that can be completely closed off for separate guests or used for family and friends sharing a connected villa. 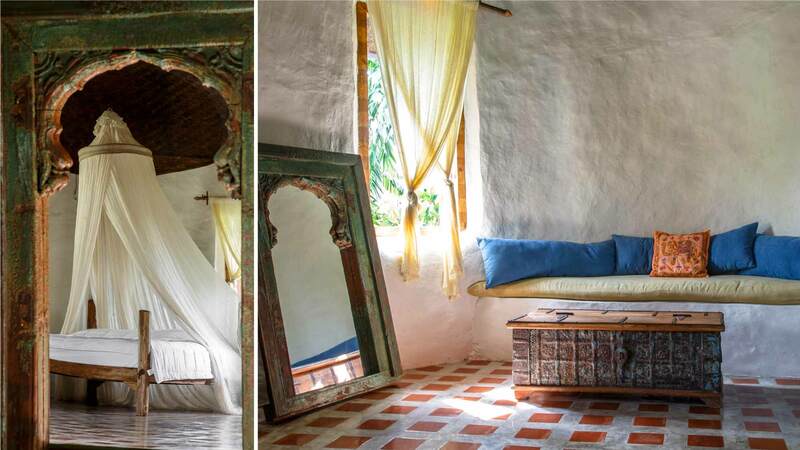 However, these two villas, each with high ceilings and unique tile floors, can be combined into one luxury villa with large living room and bedroom. 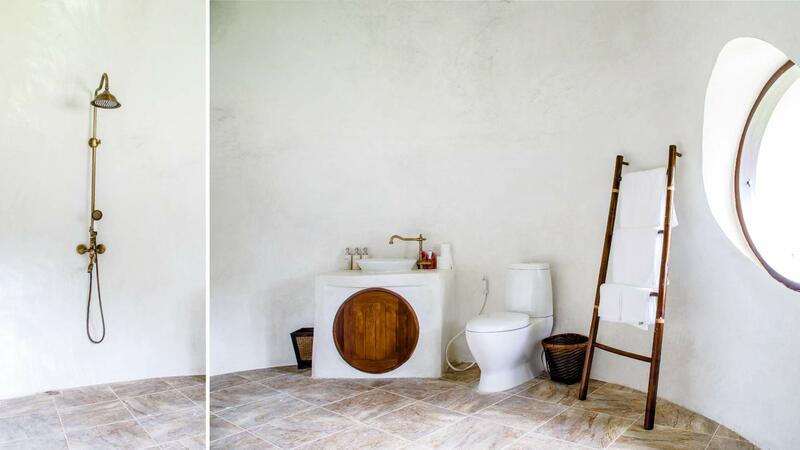 The outdoor bathrooms, while only 2 meters from the villa, might strike some people as an inconvenience but have proven immensely popular for shy couples and twin room retreat guests who prefer to step away from the room for a moment of privacy. 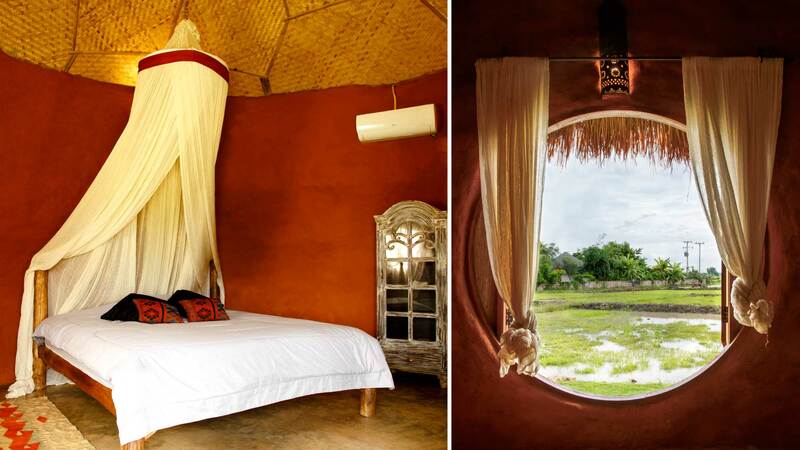 The Mala Villas are earthen structures mixed with brick work, large beds, cotton mosquito nets and tastefully chosen furniture. Each have their own air con, fridge, wifi and fans. 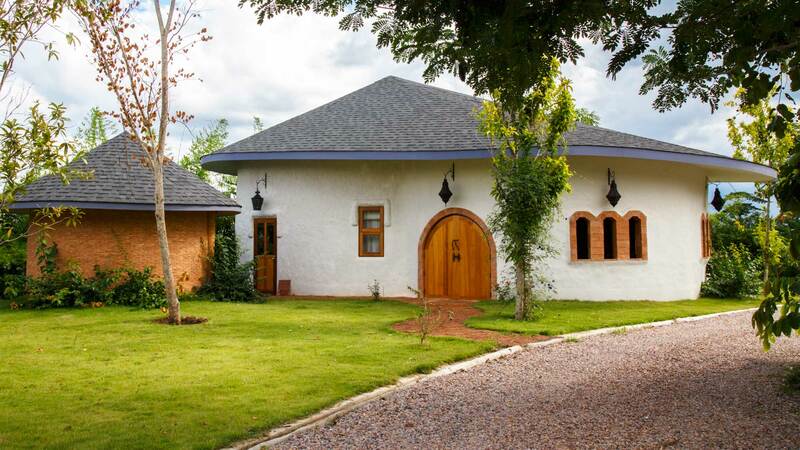 An earthen adobe brick design, hand molded on site and lovingly assembled, this villa, while smaller inside, offers the same standard of design, amenities and comforts as the other villas. With air conditioning, fan, fridge, king size bed, cotton mosquito net and spacious bathroom but situated privately among the farm- at the edge of the resort. Jai Dee Villa has sweeping views of the mountains and is perched above the gardens and rice fields of the Organic Farm. 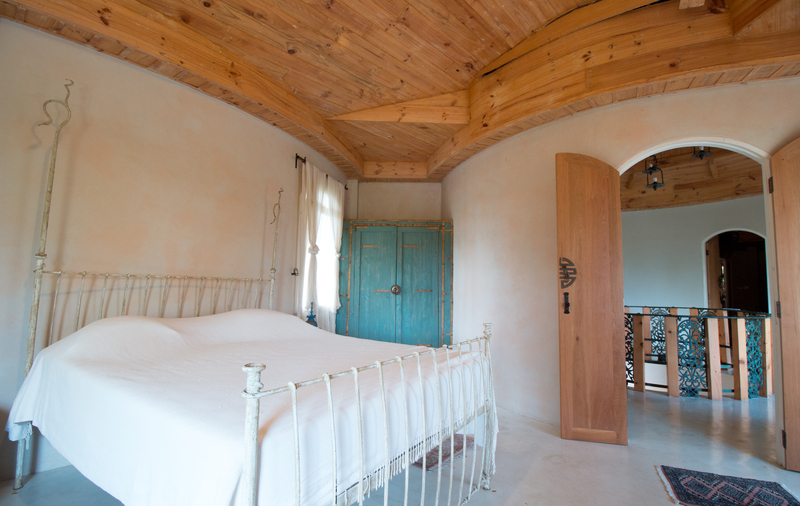 Jai Dee villa is a round building of adobe earthen design located between Gluay Yoga Shala, the Herbal Sauna, and our Organic Farm. The Jai Dee Villa got it’s name from Jai Dee (good heart, in Thai) the rescue water buffalo. 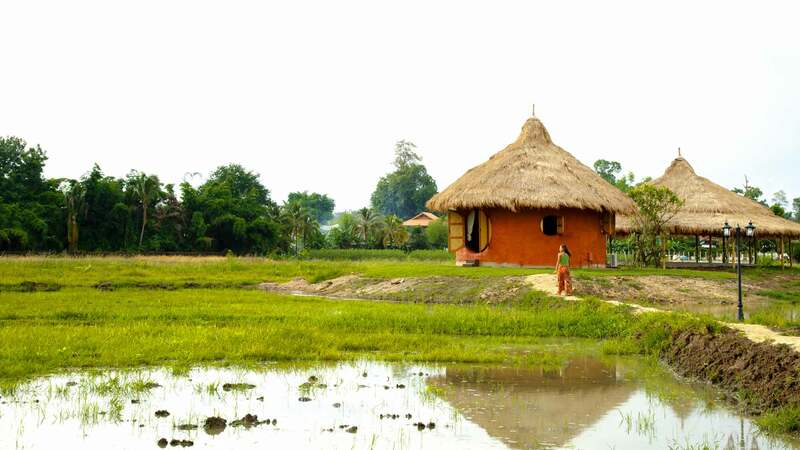 Jai Dee loves to roll around in the mud in his free time and the Jai Dee villa provides great views of his exploits as it is located among the rice fields on venue's Organic Farm. This location offers the most private setting to stay at the venue and perhaps the most unique. When opening the rounded windows of the Jai Dee Villa, you will be immediately struck by the sweeping views of the distant mountains of Doi Saket, preceded gently by the vast expanse of green rice fields. 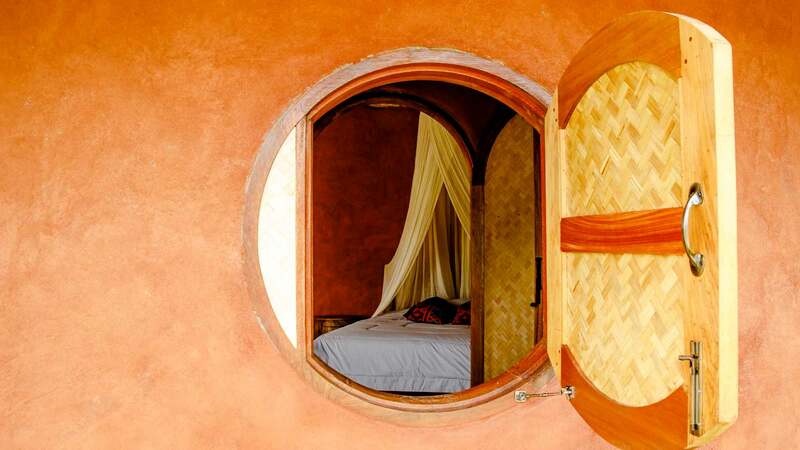 The entrance to the Jai Dee Villa is one of the iconic round wooden doorways found at the venue and leads to a small but cozy villa, perfect for a romantic escape or solitary retreat. The ceilings are high and decorated with Thai woven bamboo designs. 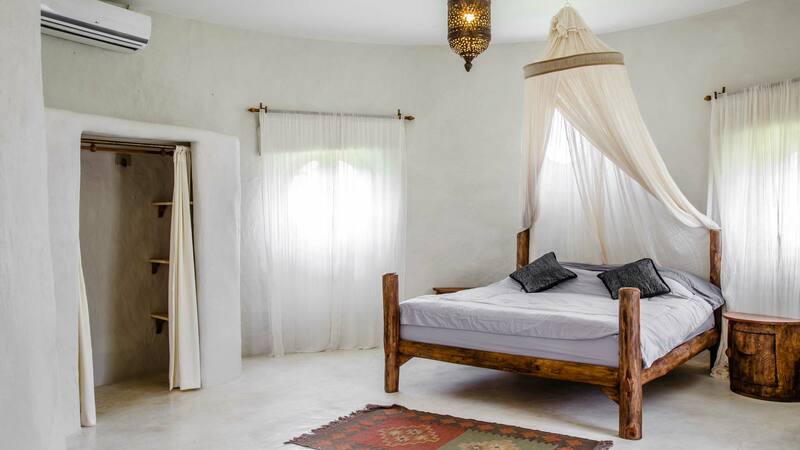 The bed is large and seems to define this villa as one of where a luxurious nights sleep means being out in nature but with all of the creature comforts you need such as epic views, breezy nights, a cotton mosquito net, fluffy pillows, a rain shower, air conditioning and fridge. Please check the Frequently Asked Questions common to all our retreats here.